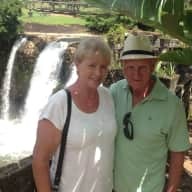 Hi, we are Georgina & John and we live in Mandurah, Western Australia. We were both born in England and both still have relatives that we visit from time to time. We are avid animal lovers who also enjoy gardening, going for long walks and travelling and exploring this wonderful country of ours. We are both fit and healthy, reliable and honest and non smokers We would take care of your pets and look after your home as we do our own home and would be very respectful of your neighbours. We are hoping that you will give us the opportunity of showing you how well we can look after your home and make your pets feel loved and cared for while allowing you to have a worry free time away from your home. 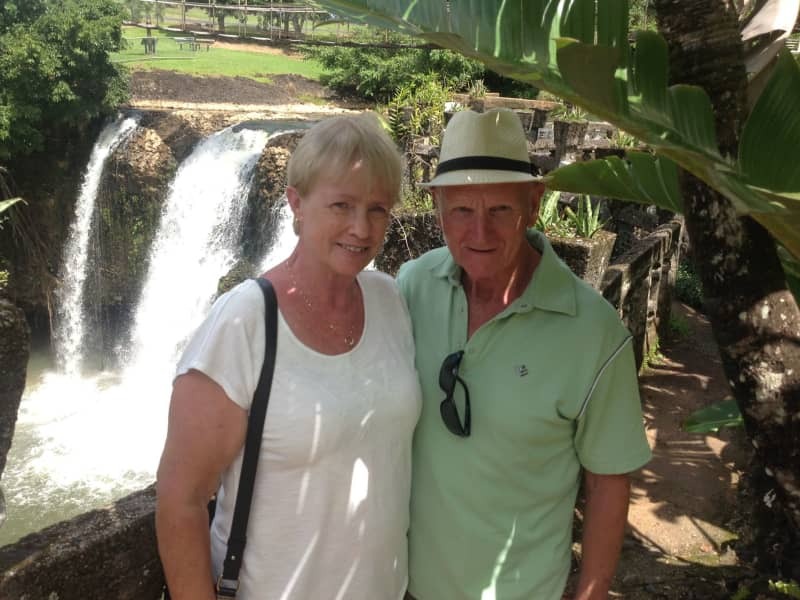 We own our own home in Meadow,Springs, a suburb of Mandurah, Western Australia and have recently arrived home after having a wonderful year travelling the East Coast of Australia in our caravan, where we began our House Sitting adventures. John is a retired farmer and Property Manager And I am Semi retired and worked for Telstra for 20 years as a Personal Assistant and took the opportunity of redundancy when it became available. We are coming back to UK in July/August along with my sister and brother and their partners for a holiday and to catch up with family. My husband has a sister who lives in Kirkham, near Preston and we are going to Tenerife for 2 weeks. We will then join my sister and brother and partners to meet family in Sheffield for the first time (long story). We are then hiring a car to visit the Lakes District and then a canal boat tour in Oxford amongst various other activities. We would like to continue our stay in the UK for a while longer after our family have gone their own directions at the end of August, and are looking to broaden our experience in House sitting. Georgina and her husband John looked after our house and two cats for a week in Toodyay Western Australia. As soon as we met them we felt at ease in their company and our cats really liked them which was most important for us knowing that they and the house will be well looked after. They did a wonderful job keeping the house clean and tidy and keeping the cats happy. I would throughly recommend them, such wonderful people. I have already booked them for two more times this year. Thank you is not a big enough word to describe the gratitude we feel towards Georgina and John looking after our vineyard/home/animals and a very mischievous golden retriever. Georgina and John where an absolute delight to have in our home. They were friendly and polite, and treated our home as if it were there own. Our cats were very well cared for, and they kept in contact whilst we were away. When we arrived home, our house was probably cleaner than we had left it! They had also kindly replaced pantry items they had used, going above and beyond. My neighbours also commented that John had kept the yard clean. You will be very lucky to have Georgina and John care for your house and pets, and we can only hope they will be available to mind our place again in the future. It was absolutely wonderful having Georgina and John come to house sit, look after my garden and my little cat. On first meeting them I knew that I had made the right decision and left for holidays without any concerns what so ever. On returning the house and garden were in perfect order. In fact I don't think I have ever seen it look so tidy! I would not hesitate to recommend Georgina and John to anyone considering them for house sitting. Hopefully they might come back to visit me again in Port Macquarie some day. We loved having John and Georgina house sit while we were away! Our house and garden was in better shape when we got home than before we left! Mia our dog was very content and well groomed. We got home after dark so it wasn't until the following day that we got to see the amazing transformation that had occurred while we were away. John did an incredible job pruning, weeding, cleaning the outdoor furniture. It really looks amazing. We did not expect him to do so much! The house itself looked a million dollars inside. Everything was spotless and shiny clean! Thank you both for doing this! Mia was very well loved while we were away. She was regularly walked and we were sent photos and videos of Mia chasing sticks. She had been freshly bathed just before we returned home. Georgina and John sent us a weekly update of Mia and how they were doing. This was lovely as it was good to let the kids know how Mia was going and show them recent photos - the kids really missed Mia. The neighbours commented to us what a lovely couple they were and how well they looked after the house. While we were away we felt well informed and confident that all was well at home. We would have John and Georgina back anytime! John and Georgina looked after our home and dogs for a month recently and we could not have asked for more. We got to meet them before and go through things a few times which was great. We got updates on our dogs which was really appreciated and they even had to get one of them to the vet and looked after everything to do with both of them so well! The house we returned to looking spotless and everything was in working order. What ever we asked John and Georgina were more than happy to do and they were honestly great and extremely trustworthy! Would definitely recommend them to look after a place. OUR FIRST HOUSE SITTING ASSIGNMENT! Could not ask for better sitters at such short notice! Our dogs were walked everyday and very happy on our return. The house was left beautifully clean, as was our lawn and garden....even, to my surprise, our fridge! Would definitely recommend these sitters to anyone looking and would be more than happy to have them back again. Georgina and John have looked after our home and two cats twice now. On both occasions, they have provided an exception level of care to our cats, and provided regular updates. One of our cats is very timid, and she was provided extra love and care. Our home was immaculate when we returned, in better condition than when we left! We have a medium to high maintenance yard, which was always kept tidy. They are helpful, kind and considerate, and I would absolutely recommend them to anyone, and I look forward to having them care for our home and cats again. 10 stars.